One of WhatsApp’s most requested features has arrived: You can now slap a password on your WhatsApp account, preventing prying eyes from looking at messages to the squad, photos of your dinner, or whatever else you use your phone for. WhatsApp has long had the benefit of end to end encryption, meaning no nefarious types can intercept your messages in the air, but none of that matters if someone manages to unlock your phone. This new update, pushed this Sunday, now lets players add a pin, fingerprint or even face ID lock to gain access via a new screen lock feature, which will work on iOS and Android as long as you have WhatsApp version 2.19.21 installed. To set it up, you’re going to need to go to the settings menu — look for the little wheel, but your mileage may vary if there’s no options cog, that’s just the iOS option — and then dig into account, which will give you advanced security and privacy options. This isn’t a silver bullet for WhatsApp access. You’ll be able to answer WhatsApp calls using the service without unlocking, and if you have notifications turned on you’ll be able to respond to those directly from the notifications. Still, it keeps your privacy mostly intact. Now all you have to worry about is people looking over your shoulder as you browse your messages. There’s not much WhatsApp can do about that. 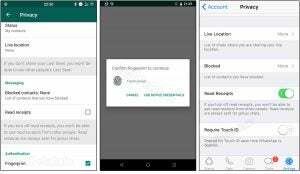 The post You can now lock your WhatsApp chats behind a password — and here’s how appeared first on Trusted Reviews.